I was recently sitting around the dinner table hearing the usual “Grace Before Meals” when something occurred to me. Do we live our lives like the mundane words we mutter before we eat a meal or do we feel the passion behind our words and actions and live life to its fullest? Do we feel blessed and thankful as we recite the words of a blessing or have they become just words that have lost their meaning? Do we even feel at all or are we trapped behind the motions we play out day after day? Do you still get excited or moved to tears or are you there just existing and feeling nothing? I think it’s important to ask yourself from time to time so you don’t spend your precious hours and minutes existing while forgetting to live. I see it happening all around me. People sitting in rooms together but not really engaging. Often times our emotions and feelings get drown out by the tv, cell phones, laptops, and distractions that have sadly replaced our interactions. It’s almost as if everyone has become numb to being in the moment and actively participating in what is going on right there face to face. Can we get beyond the small talk and find the words to let someone else believe their life matters to us? Can we get as excited over a story someone shares as we do watching someone score a touchdown on TV? I guess I am sometimes the victim of subtle knocks that I go overboard when it comes to holidays or events. The truth is I embrace those times and I stretch them out as long as I can and with as much enthusiasm as I can so they aren’t like just another meaningless mundane day. So, if I decorate for Christmas extra early, post too many pictures, get excited over every little thing, maybe you should take some notes. At the end of life, I will not be regretting what I didn’t do, what I didn’t say or what I didn’t feel. Because each and every day, I get it done with as much enthusiasm as any one being can contain. Life with no regrets, and living and celebrating each minute, that is my gift to myself and everyone around me. Some people love that about me, and others find it completely annoying. We are all different and that’s okay. One thing is for sure though, if you just go through the moments you will have regrets, but if you make the effort to live each one more fully, you will be amazed how your life will change. I always write about the important days. Those monumental moments that stay forever in my heart and inspire my soul. Today is one of those very special days. I remember as a small child being up on stage to perform my tap or acrobatic routine. Sometimes I would dismiss my nervous energy just long enough to look out in the audience and scan what looked to me at the time as a very overwhelmingly large crowd. It was in that moment, my spirit soared. There they all were! Great aunts and cousins sitting there just for me, even though they lived an hour away. Boy was I blessed. That memory stayed with me all these years. I was important enough that so many seats would be filled to celebrate my life. That is how I was raised and for that, I will be forever grateful. Today, my niece is dancing in The Nutcracker. Let me rephrase that just a little bit. 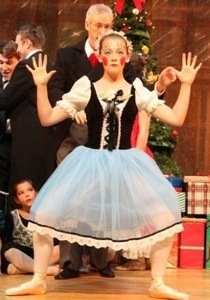 She is starring in The Nutcracker with many different parts, the two most important, being the doll, and Clara. Recently, my brother had a baby so it was important for me to fly and see the little guy. And fly I did. I am so grateful for that opportunity. However, since we are all flying again for Christmas, it hurts my heart that I am unable to be there to watch my beautiful niece today fulfill a dream she has held in her heart for so many years. If I could count the tears I have shed for missing so many events in my heart I want to attend, I swear I could fill a small ocean. It’s killing me to not be there, but nonetheless, I am so very proud of her. In my heart, I am there in the front row, watching through tear filled eyes beaming with pride. I love you Kelsey and hope you know that this is one of my important days sweet girl. I am thrilled I got the chance to watch you dance the doll, and with the help of God, next year I will be there to watch you dance again. There is a lesson here. Your presence, or lack of in a child’s life can make a difference. Whether you choose to be there for those moments helps to determine their self worth. I am there for as many of those moments as I can. If you live close enough and choose not to be there for moments like these, shame on you. At the end of our lives, these are the moments that imprint our hearts and attach to our souls. Be there. Be the difference. It’s hard not to relax when you light a fire, throw a pillow on the floor, grab a blanket, and just let yourself be. That is where you would find me if by chance you could peer into a window of my home. There are millions of things I need to be doing, but just for tonight, I am taking a few hours off. Sometimes I wonder if time only exists in my mind. Some preconceived notion of what I should accomplish with each full circle of the hands of the clock. Tonight, I put my clock on pause. We go and go and go until we are so completely fatigued that just the thought of what we need to do becomes overwhelming. So, that is our red flag to slow down the pace of life while pushing the pause button on our imaginary and self induced busy schedule for a little bit of good ole fashioned down time. The dishes can wait, the laundry can pile up, and I in return will I catch up on doing nothing. Holidays are great but traveling and eating are always quite exhausting. So, tonight’s schedule will be filled with my feet being propped up and a whole lot of rest and relaxation. Anyone care to join me? As I sit here resting after days of baking cookies and pies, I am reminded of a time nearly 10 years ago when I took the challenge to make my very first apple pie all by myself. I had 2 very young children then and happily added my apple mixture into my crust and popped it into the oven. If you have read some of my other posts, it would come as no surprise that I have lit many oven mitts on fire while I am still wearing them on my hands. So, hint, great Christmas present idea….non flammable oven mitts. This day was no exception. Before I realized what was happening, I looked into my oven and flames were shooting everywhere. I tried to beat the fire with a dishcloth that too caught on fire. My smoke detectors were going off and I was in pure panic mode as my poor distraught children watched in horror. The good thing about this story is that my house did not burn down, and after a small Xanax pill, I returned to normal. The best part was the lesson I learned and will never forget, always have something under the pie to catch the drippings. That day I did not find anything humorous about the whole situation, but looking back on it today I have to giggle. Life is an ongoing lesson, and sometimes it’s important to pause for a moment and remember just how far we have actually come. It’s a funny thing. I try and try to find ways to spend time with my kids doing things they are willing and actively wanting to take part in. I guess sometimes I am caught off guard at exactly what those things are. There was no school today and I woke up very early while the kids were snuggled up in bed asleep. 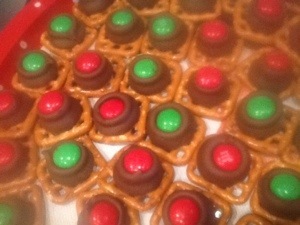 I decided to pull out the baking sheets and make the pretzel snacks with the Hershey kiss and m&ms, undoubtedly one of my personal favorites. I barely started unwrapping the kisses when Chase showed up happily ready to join in. He was really enjoying helping and I appreciated him taking over the tedious task of pulling those silver wrappers off those delicious little candies. Next thing I knew, he was standing there looking all cute with the bulky oven mitt covering his hand, proudly taking one batch out of the oven and putting another in. It was a great moment just the two of us shared and he was grateful I assigned him the job of eating the imperfect rejects after our final creation was finished. You just never know I guess but I am always grateful to find something that pulls him away from video games. A special time for both us today that happened by chance. You can almost feel the excitement in the air, everyone is cordial, smiling and counting their blessings. This is one special time of year that is just about gratitude and giving thanks. No presents, no stress, just some good old fashioned eating and time with the ones we love. What could be better than that right! I can almost taste the stuffing and turkey as I write these words. My favorite though, is shopping on Friday and coming home and making a great big turkey sandwich. I love the holidays. Every single one. I was fortunate enough to grow up surrounded by extended family. I truly felt loved. We would make the hour trip each year to Aunt Gracie’s and you could feel the love as you walked through the door. People were jammed in everywhere and some of the older cousins and aunts would be fiddling around in the kitchen to make dinner just right. On this Thanksgiving, just like every other one, I will give thanks for these special people that always made me feel part of something wonderful. When I close my eyes I can still see them at the tables, sitting there talking and laughing. Many of them have passed on but they are still right here in my memories and in my heart. This year I will fill my heart with the thankfulness I feel because I was blessed enough to have each and every one of them play such an important role in my life. I hope they will have a wonderful feast in heaven and remember how much they are loved. I keep seeing these nagging insinuations and insulting comments, especially on Facebook, about the fact that some people will be shopping on Thanksgiving. I’d like to offer my two cents. For one, if you don’t agree with shopping on Thanksgiving then it is your prerogative not to do it. However, I would like to bring up what may seem as a silly point to some. Football is on 4 days a week. If I take the time to travel and visit with family, I am insulted the tv is even on. Yet, for most people there would be no Thanksgiving without sitting around a football game. But, that is not my choice to make. To each his own. What I don’t like is how we are always trying to make others feel guilty for the choices they make but yet, when we turn the finger around and point it the other way, all of a sudden it becomes none of our business. I remember traveling to Dallas last year for Thanksgiving. We stopped at a Starbucks halfway in between for coffee and restrooms. I remember a conversation I had with 2 of the counter workers. I asked if they were bummed they had to work on a holiday. Both agreed they were ecstatic. They only had to put in a few hours and the extra money they would make getting paid time and a half would go a long way that time of year. So, remember we all have the right to make choices that suit ourselves and our lifestyle. If you want to point a finger at me because I may swing by Walmart to get a 50 inch tv at the price of $288.00 think again before you criticize me. It just might be the tv that allows you to watch football at my house if you ever happen to stop in on Thanksgiving. So there!